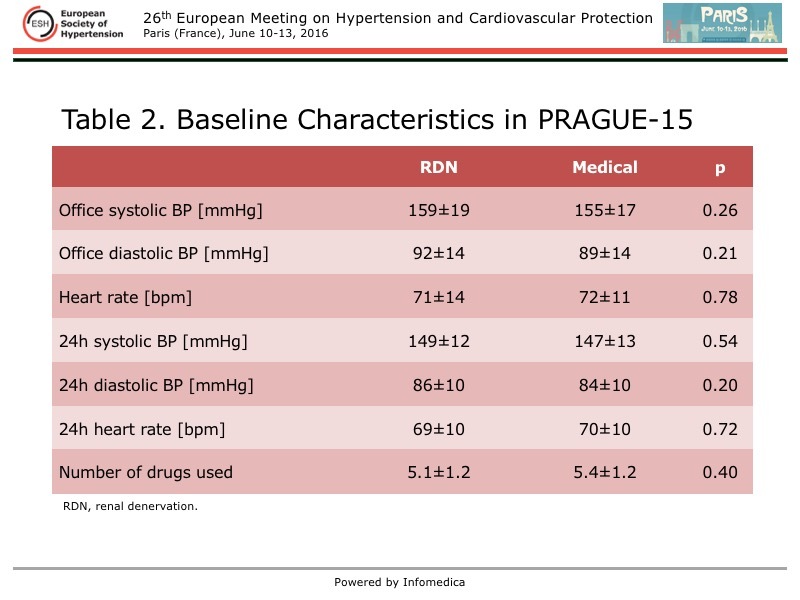 Renal denervation was not superior to intensified medical treatment in patients with validated true resistant hypertension, in the 12-month results from the PRAGUE-15 trial. 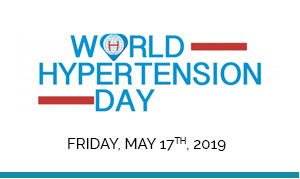 The addition of spironolactone, if tolerated and maintained, was more effective in reducing blood pressure, according to Jan Rosa, General University Hospital, Charles University, Prague, Czech Republic. 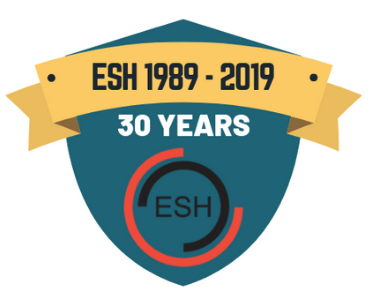 The prospective, open, randomized, trial was conducted at 3 centers in Prague to evaluate the effect of renal denervation with the Symplicity catheters compared with intensified antihypertensive therapy including spironolactone 25 mg on 24-hour blood pressure. 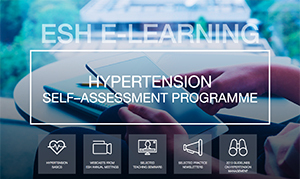 Two mandatory requirements for study inclusion were the exclusion of secondary causes of hypertension and adherence to prescribed antihypertensive medications by plasma drug level measurements. 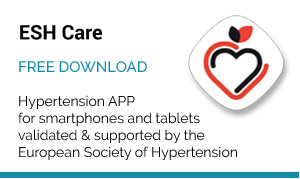 Resistant hypertension was confirmed by 24-hour ambulatory blood pressure monitoring (ABPM), with a level >130 mmHg. Suitable renal artery anatomy was confirmed by imaging. In this study, patients were randomized to renal denervation or intensified medical treatment. At 1 year, patients could crossover to the other treatment if their blood pressure remained above goal. The primary outcome measure was 24-hour ABPM levels at 6 months. PRAGUE-15 was terminated after the results of the Symplicity HTN-3 were announced. At that time, 106 patients had been randomized in PRAGUE-15, and 12-month follow-up data were available in 101 patients. 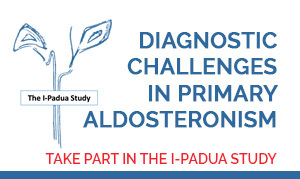 The intention-to-treat (ITT) analysis of all randomized patients was presented, and the results of the per-protocol (PP) analysis in a subgroup of patients who had complete renal denervation, defined as ≥4 ablations, or had spironolactone added and maintained. The 51 patients in the renal denervation group and the 50 patients in the medical treatment group were similar at baseline, except the body mass index (BMI) was significantly higher in the medical treatment group (Table 1 and Table 2). 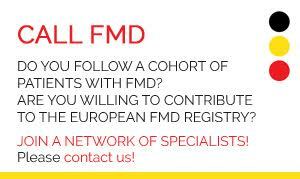 However, after 12 months, the BMI was similar in both groups. No differences in blood pressure measurements were seen between the groups. Patients in both groups were taking an average of five antihypertensive medications. 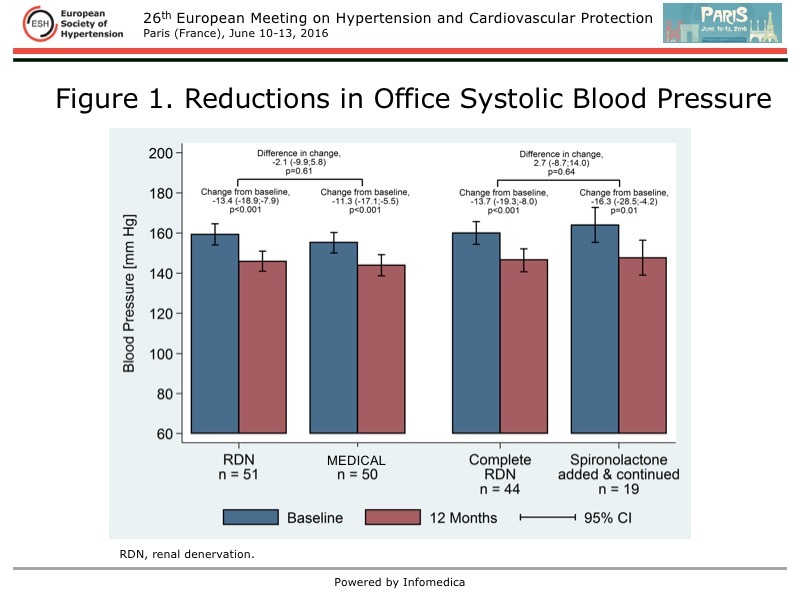 At 12 months, a significant reduction from baseline in systolic blood pressure (SBP) measured in the office was found within the renal denervation group and within the medical treatment group, but there was no between-group difference for this reduction (Figure 1). This was observed in the ITT and PP analyses. A similar pattern was seen for the 24-hour SBP measured with ABPM in the ITT analysis, with no between-group difference in the change in blood pressure from baseline, despite within group reductions in SBP (Figure 2). In contrast, in the PP analysis, a significant between-group difference was found, based on a greater reduction in 24-hour SBP in the medical treatment group than in the renal denervation group (15 mmHg vs 6.3 mmHg, respectively). The between group difference was 8.7 mmHg (p=0.04) for 24-hour SBP in the PP analysis. The change in the number of antihypertensive medications from baseline was similar in both groups in the ITT analysis, but in the PP analysis, it was significantly higher in the medical treatment group. Regarding changes in laboratory values at 12 months from baseline, in the ITT analysis, the between-group difference in creatinine was -7.8 µmol/l, but this was not significant (p=0.04), and there was no change creatinine clearance. In the PP analysis, in the medical treatment arm versus the renal denervation arm, there was a significant reduction in sodium (-1.5 vs -0.1 mmol/l; p=0.02) and significant increase in potassium (0.2 vs 0.1 mmol/l; p=0.049). A similar pattern was seen for a change in creatinine (-8.4 µmol/l between-group difference; p=0.04), but there was no change in creatinine clearance. 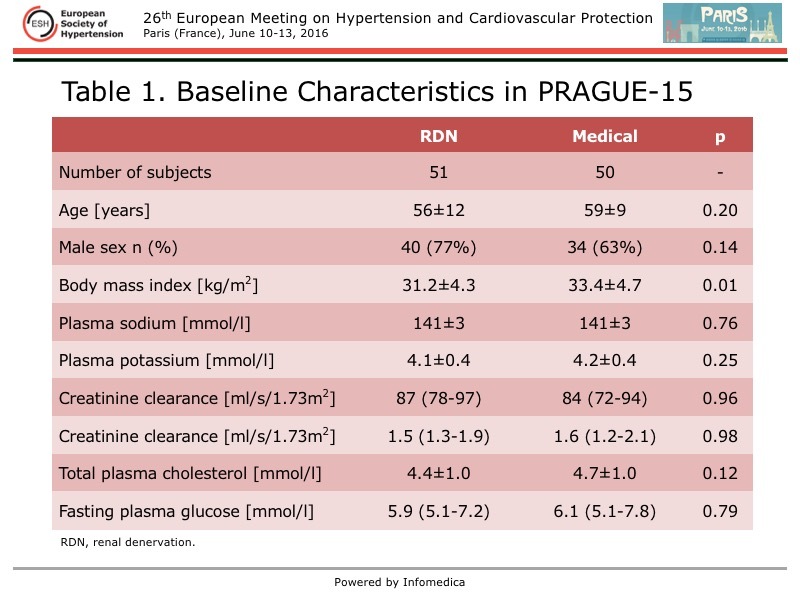 The PRAGUE-15 study demonstrated the safety of renal denervation, with no observed relevant structural changes in the renal arteries. 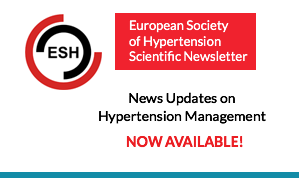 However, these results do not support renal denervation as being more effective than intensified medical treatment with spironolactone for the treatment of true resistant hypertension. As such, renal denervation should not be considered a routine therapeutic approach in this setting, stated Rosa. 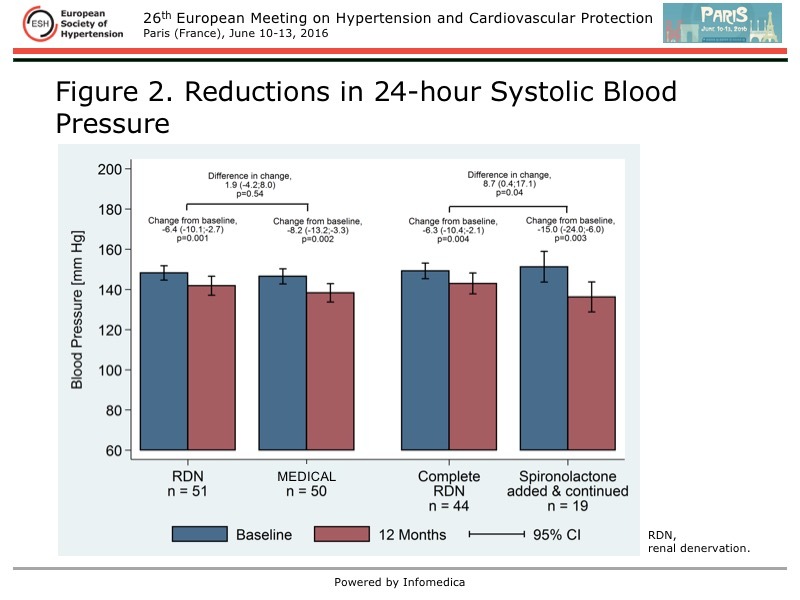 Spironolactone was more effective in reducing blood pressure, when it was tolerated and continued, raising the question of whether eplerenone should be used more frequently in this patient population.